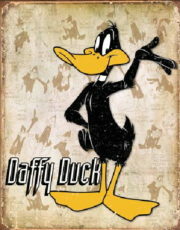 This is a 12 1/2″ x 16″ heavy grade vintage tin sign that features the retro animation art of the popular Looney Tunes character Daffy Duck over a collage of animation layouts. These are produced in the style of the original tin signs that were common in the first half of the 20th century. This sign is intentionally made with defects, including rust on the edges, in order to give it the appearance of an authentic aged sign. 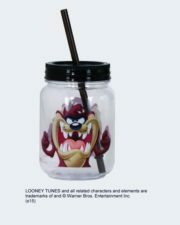 This is an illustrated, 12 ounce, clear acrylic mini mason jar featuring the animated art image of an angry Tasmanian Devil “Taz” from the popular Looney Tunes cartoons. Looney Tunes, the memorable cartoon from all of our beloved childhoods is back at it again. From Bugs Bunny to Tweety, this animated series had it all. 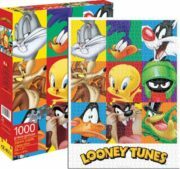 Throw on all of the classic ACME antics and piece together these fan favorite Looney Tunes characters in this 1,000 piece jigsaw puzzle. 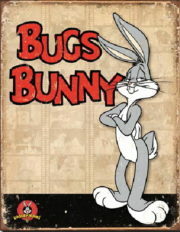 Everyone’s favorite rabbit, Bugs Bunny is featured in this deck of Looney Tunes playing cards. This is a regulation deck of poker size playing cards which features 52 different animation art images, one for each card in the deck. 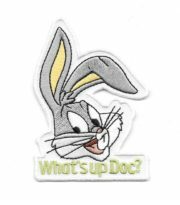 This is a mint, unused patch that depicts the head of Bugs Bunny above his famous phrase “What’s up Doc?”, one of the more popular cult favorite Looney Tunes cartoon characters. It measures 3.25″ high. This amazingly detailed model starts as a 4″ square sheet and finishes as a 3-D Caricature model. It is approximately 2.75″ tall when assembled and this one features Bugs Bunny from the popular Looney Tunes cartoons and comic books. The sheet contains detailed laser etching for easy removal. Complete instructions are included to show you how to pop out the pieces, bend the tabs, and connect them at the attachment points with an average assembly time of 30-45 minutes. It has been stored in a smoke and pet free environment. We also offer an optional LED base or a Solar Spinner for better display of your model. 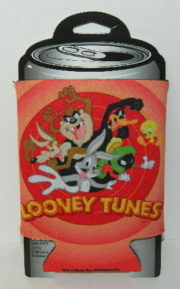 This is an illustrated insulated neoprene drink can cooler featuring the more popular Looney Tunes characters in a wraparound design. They include Bugs Bunny, Tasmanian Devil, Daffy Duck, Wile E. Coyote, Marvin the Martian and Tweety Bird. 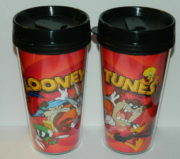 This is an illustrated new and unused plastic thermal stein, designed to keep hot foods/drinks cool or cold for extended periods featuring the more popular Looney Tunes characters in a wraparound design. They include Bugs Bunny, Tazmanian Devil, Daffy Duck, Wile E. Coyote, Marvin the Martian and Tweety Bird. 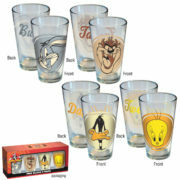 This is a set of four illustrated, large 16 ounce clear pint glasses with the images of the faces of four of the more popular Looney Tunes characters. They include Bugs Bunny, Tazmanian Devil, Daffy Duck and Tweety Bird. 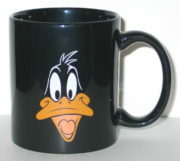 This mint, unused black ceramic 12 ounce coffee mug features the animated image of the face of Looney Tunes Daffy Duck on the front with the Looney Tunes logo with Bugs Bunny in the middle on the back. Produced in 2010 and no longer being made, this is a 12″ x 6″ galvanized metal embossed license plate featuring the characters from Looney Tunes. This one features Daffy Duck. 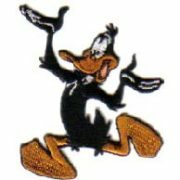 This is a mint, unused patch that depicts a full figured Daffy Duck running, one of the more popular cult favorite Looney Tunes cartoon characters. It measures 3″ high. This is part of the FUNKO line of POP! 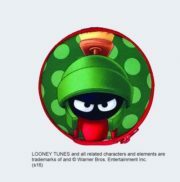 vinyl figures and this series features characters from the animated cartoons of Looney Tunes. 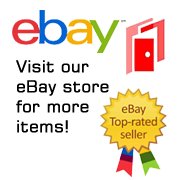 This figure measures 3.75″ high, comes in a sealed illustrated box with a clear plastic front that displays the toy. 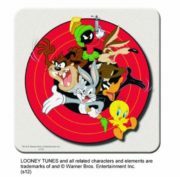 This is a set of 8 recyclable paperboard coasters measuring approximately 4 x 4” featuring the art image of the group cast of characters from the animated cartoon series Looney Tunes. 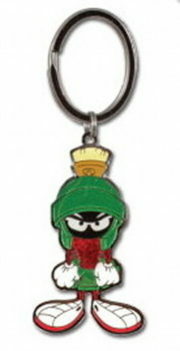 Produced by Pinnacle Designs in 2014 this is a licensed 2″ x 1”, metal, glitter, freeform, keychain that features the character image of Marvin the Martian from the famous animated cartoon series Looney Tunes. 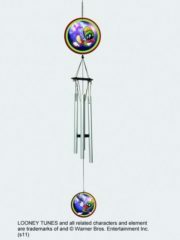 Produced by Spoontiques in 2014, this is a licensed wind chime that measures approximately 31” featuring the image of Marvin the Martian from the famous cartoon series Looney Tunes. 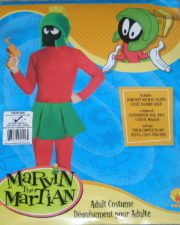 This is a licensed adult costume from Rubies featuring the popular Looney Tunes character Marvin the Martian. It contains a green and red jumpsuit and skirt plus a plastic helmet along with a cloth black mask and white gloves. 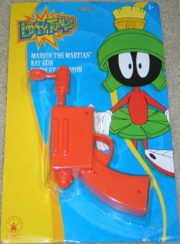 This is a licensed costume prop from Rubies featuring the ray gun used by the popular Looney Tunes character Marvin the Martian. It measures 9″ long, is sealed in the blister and is stored in a smoke and pet free environment. Produced by Spoontiques, these are white earbuds that also come with a red and green polka dot zip up carrying case that features the image of Marvin the Martian from the Looney Tunes. 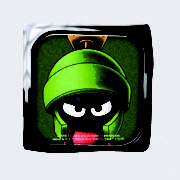 Produced by Spoontiques, this is a decorative visor clip featuring the image of Marvin the Martian from the Looney Tunes. This amazingly detailed model starts as a 4″ square sheet and finishes as a 3-D Caricature model. 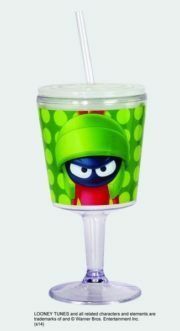 It is approximately 2.75″ tall when assembled and this one features Marvin the Martian from the popular Looney Tunes cartoons and comic books. The sheet contains detailed laser etching for easy removal. Complete instructions are included to show you how to pop out the pieces, bend the tabs, and connect them at the attachment points with an average assembly time of 30-45 minutes. It has been stored in a smoke and pet free environment. We also offer an optional LED base or a Solar Spinner for better display of your model. 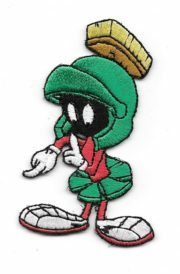 This is a mint, unused patch that depicts a full figured Marvin The Martian, pointing his finger, one of the more popular cult favorite Looney Tunes cartoon characters.